Still debating what to do tonight in Philadelphia ? 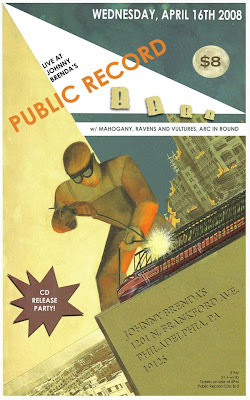 Former BOS Artist Of The Day, Public Record, with their exciting blend of instrumental jazz/ska/rock takes the stage at Johnny Brenda’s to celebtrate the release of their new CD on High Two Records. I’ll Be there, come on down and say hi. There’s a reason Rolling Stone magazine picked Philadelphia as it’s Hot City recently. The city’s music scene has more amazing quality bands playing around town on a regular basis than it has in at least 20 years. I mentioned The Swimmers earlier this week, they’re playing a cd release party at Johnny Brenda’s tonight. Grammar Debate and The Creeping Weeds are just a couple doors down at The M Room. Philadelphia’s Fishtown section is going to have the roof blown off all around. 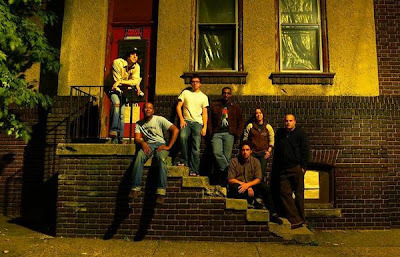 Beretta 76 are taking their blistering rock show on the road to Trenton NJ and are playing the 449 Room tonight, and today’s featured band Public Record brings it to The Khyber in Old City along with Brown Recluse Sings. That’s just four of the many choices for tonight. All of them well worth seeing on any night. Public Record lists their influences on their myspace page as Bohannon, Orange Juice, Al Green, Studio One, Caetano Veloso, Motown, Joe Gibbs, Stax, Josef K, Broadcast, Ethiopiques, Channel One, James Brown, Jackie Mitoo, Talking Heads, The Contortions, Jorge Ben, Sound Dimension, Big Flame, King Tubby, David Axlerod, Hard Bop, Impressions, Fela Kuti, Sonic Youth, Stereolab, Carlton & the Shoes. Now I’m sure as you read that list you’re probably saying to yourself how can they possibly roll all that into one sound. As I sit here listening to a couple mixes of tracks from their upcoming release I’m trying to put into words for you how it all really does make sense. An all instrumental septet, they bake jazz,funk,indie rock,afro beat and more into one heavily danceble, highly textured rhythmic cake, all iced with Hilary Baker’s slinky saxophone lines. Their new record on Philadelphia’s own High Two label comes out early next year and it’s one you don’t want to miss. Many thanks to Gareth for sharing an early taste you can all hear below. Public Record w/ The Lodger, Small Sins, & Brown Recluse Sings. Around 9:15 or so Philadelphia’s Public Record hit the stage to kick off the Monday evening festivities @ Johnny Brenda’s last night. I had never seen them before but their blend of instrumental-ska-jazz-dance music really rocked the house. I could easily picture this band opening for someone like !!! or LCD Soundsystem and packing the dance floor with gyrating bodies. With a two drummers,two guitars, a bass and a saxophone in the lineup, they know how to cook up a good groove. Someone I will definitely see again. Ladybug Transistor was up next with a smooth pop set that seemed influenced equally by the late 60s early 70’s west coast pop sound as it did from 80’s new wave folk sound of bands like the Go Betweens. The Clientele finished out the night with a set that drew heavily from their brilliant new disc God Save The Clientele. Live, their Beatle tinged pop songs definitely took on an added dimension that made them sound even better. An excellent show by a band that is most likely going to pick up a lot of new fans soon.